We are accepting Police Scrapbook Readers Layouts for our Readers Gallery and will be offering a free gift or gift card for the best of the first 10 submissions in all categories. We are looking for any Police or Sheriff Scrapbook Layouts - any Law Enforcement Scrapbook Layouts or Cards to honor our Law Enforcement heroes. We want to hear about your special hero and maybe why you did the layout. Then we also want to know what you used for the layout, your background paper and embellishments. Where did you get the items for your layout (if you can remember) or did you make them yourself. Once you have submitted your layout or card below, our moderator will set up your own page on the scrapbook-advice.com website and send you an e-mail with that link. Then you can send that link to your friends and family to have them comment and grade your layout. Two weeks after we have received 10 scrapbook layouts, we will award a prize to the layout with the highest scores. We will need your snail mail address to send you your gift or gift card. You may enter up to 8 different layouts or cards in any of our categories for each prize. Do you have another Military Scrapbook Layout or Card? We are also accepting layouts and cards for our contest at Air Force Scrapbook Layouts, Army Scrapbook Layouts, Coast Guard Scrapbook Layouts, Marine Scrapbook Layouts, and the Firefighter Layout Gallery. 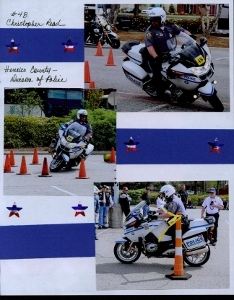 Have a Police or Sheriff Scrapbook Layout you would like to share? Show us your personal tribute to honor the service of your special Police Officer or Deputy Sheriff Hero. 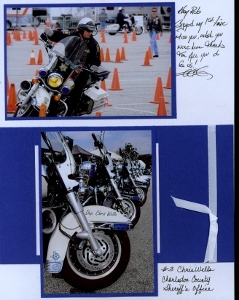 Whether its a Scrapbook Layout or a card with a Law Enforcement theme, we'd love to showcase it on our website www.scrapbook-advice.com. Enter the Title: Example "My Police Office Hero Scrapbook Layout about my Dad"